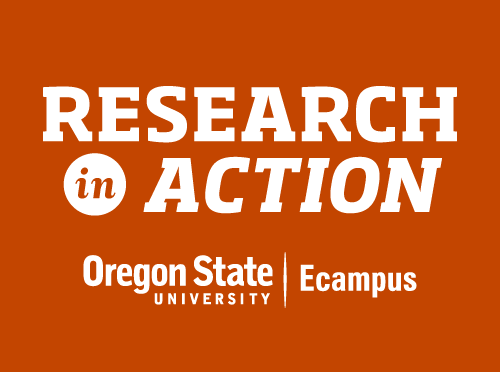 OSU Ecampus has just launched Research in Action, a weekly podcast about topics and issues related to research in higher education. The podcast features a range of guest experts from colleges and universities across the country and internationally. Each Research in Action episode also has show notes and a transcript on the website. You can find the podcast on iTunes, Stitcher, and Soundcloud. There is also a website, Twitter account (@RIA_podcast), voicemail line (541-737-1111), and email address (riapodcast@oregonstate.edu). You can also subscribe via the RSS feed. If you want monthly updates about episodes, you can add yourself to an email list on the website. According to a report published in the MERLOT Journal of Online Learning and Teaching, instructor-generated video can have a positive influence on student satisfaction with, and engagement in, online courses. But not all videos are created equal. Learn 8 high-impact strategies here. Meg Bernhard, “In Sign of the Times for Teaching, More Colleges Set Up Video-Recording Studios,” Chronicle of Higher Education, July 31, 2015. Gardner Campbell, vice provost for learning innovation and student success at Virginia Commonwealth University, says he’s seen an increase in the last five years in what he calls “self-service production facilities” — on-campus studios that require minimal setup and are easy for any faculty member to use. Indeed, those facilities seem to be appearing more and more frequently; Ohio State University’s studio opened just last fall, and one at Dartmouth College, called the “Innovation Studio,” opened in May. The article examines the increasing efforts on college campuses to provide video production support for online and hybrid course instruction.